It would be nice to think Angel Wagner’s expansive musical repertoire were born of a pure artistic exploration of polyrhythms, harmonies and lyrics — a musical bridge spanning cultures from Ireland to Latin America. It would also be somewhat disingenuous. For Wagner (vocals, maracas and bongos) and his band mates in Mariachi Fantasia, Julio Bare (guitar and vocals) and Rafael Rodriguez (guitar), musical flexibility means economic survival as much as it means artistic growth. Their willingness to embrace many musical styles and traditions — filtered through their own Latin jazz/salsa background — might mean the difference between getting that wedding gig and staying home. Not making money. And not playing. Each an equally painful option. Recently that genre-jumping philosophy landed the Beverly-based Mariachi Fantasia a gig slightly more important than the next wedding. The band won a role in the romantic comedy “Bachelor Number Two,” starring Kate Hudson and currently being shot in Boston, because they could do the Irish standard, “Danny Boy,” in Mariachi style, in four-beat ranchera style, an influence on American country music, and in two-beat corrido. The director even wanted them to translate “When Irish Eyes are Smiling” into Spanish — right on the set and then sing it in Spanish. Wagner set to work and about a half hour later had a singable translation. If all goes well, Mariachi Fantasia’s songs will be funny in the context of the movie, even though the group performed them very straight and to the best of their ability. The juxtaposition of cultures in the songs and in the movie is supposed to create the comedy, not the songs’ performances. Such mixing and matching of language, culture and musical genres have become second nature to Wagner and Bare. 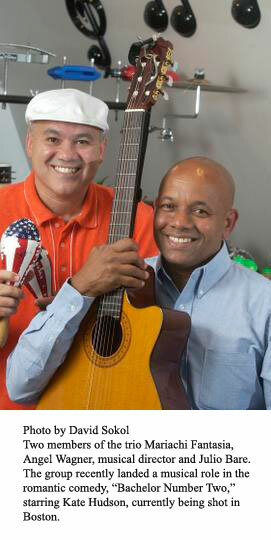 They not only have the Mariachi Fantasia group, but also have the locally better-known salsa band, Grupo Fantasia. They also have the 10-piece Orchestra Fantasia. Wagner serves as musical director for the bands. Grupo Fantasia promotes itself as a meringue/salsa/Latin jazz/calypso/reggae/Cuban band — throw in the fact both Wagner and Bare grew up in the Dominican Republic and the crisscrossing cultural influences become more dizzying. Salsa is a blend of rumba, guaguanco and the guaracha, all from Cuba, the son montuno and samba from Brazil and the bomba from Puerto Rico — Bare slaps out the various rhythmic changes on his thigh, in hand claps and voice. • Puerto Rican, which emphasizes horns — “It’s hot and spicy,” said Bare. • Cuban, which has its roots in Afro-Cuban beats and is more rhythm driven. bossa nova beats from Brazil. Even though Mariachi Fantasia might have been well prepared for the artistic demands of the movie set, the members weren’t ready for its rigors. “I never knew Hollywood was this intense,” said Wagner. The group members showed up on the set at 10 a.m., were immediately whisked off their own changing trailer and they didn’t leave until past midnight. The set is completely self-contained, Bare and Wagner said. Once in, no one leaves until the director says so. “They have catered food and you eat when you can get a break,” said Wagner. For their part, Mariachi Fantasia performed up to 30 takes per song, all in one day.